“Citizens for Jobs Now” is a group of downtown businesses, construction companies, and hotels. See the list of those providing the funding. No citizens in the list, though. Spokane PFD accused of possibly violating the law (Spokesman-Review) in sending out campaign mailers. That’s not good. The Convention Center facilities district is seeking greater taxes on hotel patrons and asking the County to sell additional bonds to raise money for the project. 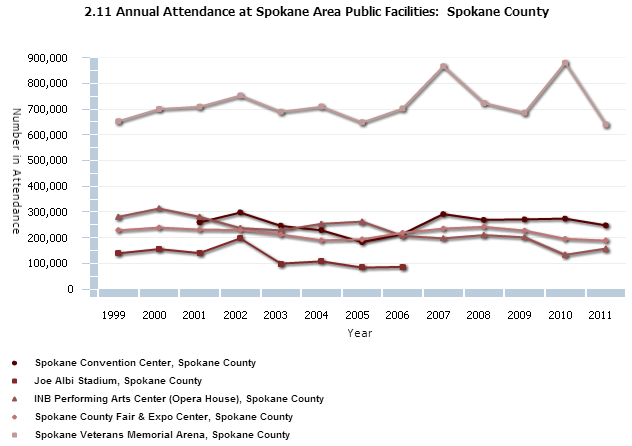 The following chart was discovered at the EWU Community Indicators of Spokane web site. As you can see, the national skating championships created a spike in attendance at the arena. Since then, attendance appears to be at or below levels seen in 1999 levels. This chart should have been available to voters in April 2012 to help them evaluate the bond initiative. In 2012, the Spokane Public Facilities District (PFD) is asking voters to approve an extension of existing taxes out to the year 2043 to further expand the convention center and add seats to the Veterans Memorial Arena (Arena). The Center was last expanded in 2007. Last year I collected PFD documents and data and wrote up much of this, which I never published. 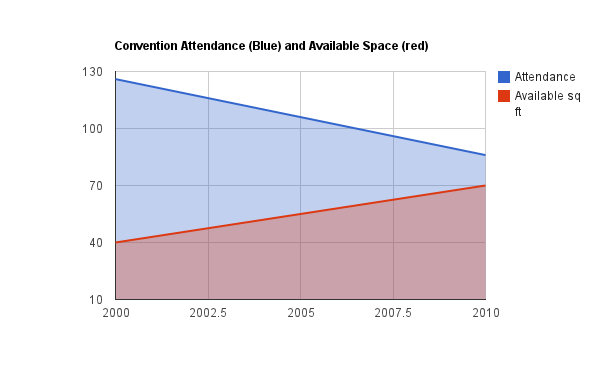 I found data on both sides of convention center expansions, in general, are a bit messy. This post is an attempt to look at the PFD expansion plans in the context of the data. 2005, 2006 and 2011 data are not available. 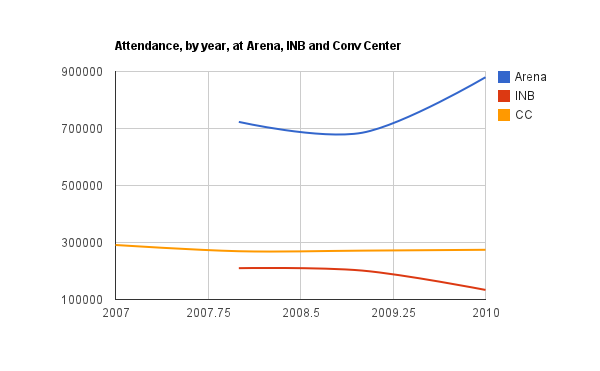 For the period for which data is available, Convention Center (CC) attendance is flat to slightly down and the INB is down while the Arena is up. Except for FY2003-2004, no other data is available. The PFD is itself apparently forecasting a decline in convention events in 2013 and 2014 (PFD meeting minutes, Item #4, Feb 28, 2012). All figures come from the Spokane PFD’s end of year reports. The Spokane PFD facilities are estimated to generate $173.2 million in direct, indirect and induced economic impacts. This figure comes from a study done by EWU’s Institute for Public Policy and Economic Analysis about the PFD – this is a good and thorough study that includes background, caveats, uncertainties and explanations. The PFD selected the dates for the study as Feb 1, 2009 to Jan 31, 2010 in order to include the US Figure Skating Championship which accounted for one-third of the overall economic impact for the year (see page 31 of the EWU study). This is disclosed in the full study but the Spokane PFD’s web site includes only the executive summary. The PFD hired a consultant to do a similar study which included the 2007 US Figure Skating Championships; that full report is on the PFD web site. The EWU report says the study period may not represent normal years. This chart is created from the data in tables 5.15 through 5.17 (page 35) of the EWU study. 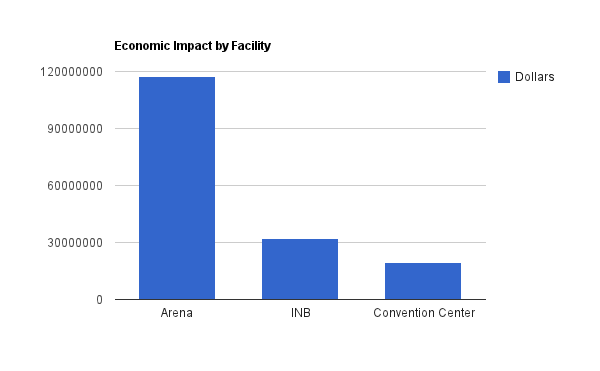 As you can see, the Arena has the largest estimated economic impacts. Click on the link to read the rest of this post – with more charts and links to the sources. You might be surprised. Because this is a long post, the full story is after the link. 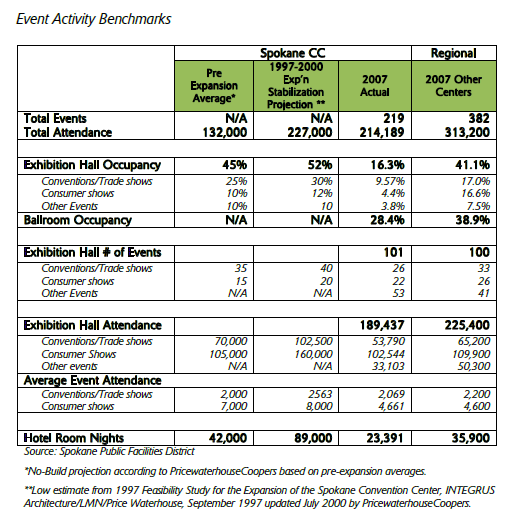 How Does the Convention Center Benefit Spokane? Convention Centers bring in visitors who spend outside money in town. The money they spend benefits local hotels, restaurants and retail businesses, and those that receive the greatest benefits are near the PFD facilities. After construction ends, most of the jobs created are low skilled, low paid hotel, retail and restaurant jobs. Some of the money earned is itself spent in the local area, increasing the level of economic activity. A group of businesses interests named “Citizens for jobs now” is promoting a yes vote on Measure 1 to be voted in April; the group is made up of the hotel, restaurant and entertainment business associations that, per the PFD’s chart, are the primary beneficiaries of the convention center business. How Many Attendees Come From Spokane? Most of them come from Spokane in terms of “attendee days”. An event that lasts 3 days could have one attendee for all 3 days and that would be 3 attendee days. For an out of town visitor, the number of attendee days translates into more hotel room nights and more restaurant meals. 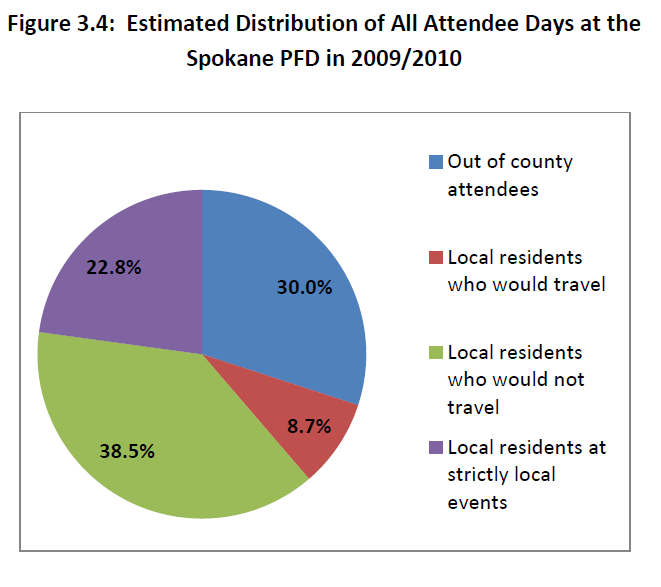 However, in terms of overall usage of the PFD facilities, Spokane County residents account for about 2/3ds of all attendee days and out of town attendees about one-third. This chart comes from the EWU study. Many local events are held at the PFD facilities including high school graduations at the INB, Spokane Shock games at the Arena, local concerts, and so on that benefit local Spokane residents. There are many other activities in Spokane that also bring in outside visitors including college sports, graduations, high school sports and tournaments, private sports such as soccer and hockey leagues, bicycling events, running events, school events, music competitions, concerts, business events, family visits, health care visits, camping and many, many more, which may use other venues in town. What percent of visitors here use PFD facilities versus those that do not use PFD facilities? What is the economic impact of non-Spokane PFD related visitors? Some events take place at multiple venues. The annual PNW Volleyball tournament took place in 2012 at Eastern Washington University, Liberty Lake HUB Sports Center and at the Convention Center. But the CH Johnson study (Table A-19, page 19) appears to attribute 100% of the 2007 Volleyball PNW economic impacts to the Convention Center and none to other venues. That does not seem right. Why Does the Convention Center Need to Expand? The main reason is to keep up with other cities that are expanding their convention facilities. The PFD says they must expand every 7-10 years to “stay competitive”. The other reason is to provide meeting rooms closer to the exhibit hall because attendees did not like the walk to the other building. In the past four years, Spokane has seen a decline in Convention Center attendance and related hotel room stays, said Keith Backsen, vice president of the convention and visitors bureau. That quote seems odd in the context of a desire to expand the Convention Center. None of the PFD documents on the proposed expansions appear to contain long term market data or charts on convention attendance trends at national or local facilities. No data! The trade show industry strongly disputes these numbers, but seems to acknowledge that these trends may be true for the Tradeshow 200 index, but that when a different measure of up to 500 trade shows, including small events, is used, attendance has grown – inmplying that the growing part of the market is in small events. If attendance is in decline (may be it is and may be it is not) and there is a nationwide surplus of convention meeting rooms then expanding convention centers merely moves conventions from one city to another – and there is no net benefit to the overall economy. 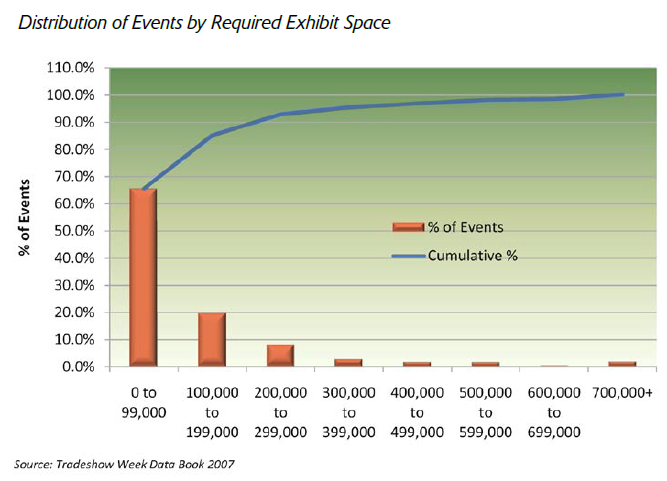 The trade show industry disputes these attendance figures but they do acknowledge that the “top 25% of event planners have been offered free or very low-cost exhibit space as an incentive to move” to a new city (page 17); when the price goes to free, that suggests a surplus of space. What Factors Do Convention Planners Consider when Selecting a Site? According to the PFD’s documents, the #1 feature is that the size of the facility is sufficient for the event, followed by such attributes as hotel rooms, parking, airline connections, and local entertainment or travel destinations. This chart shows the percent of events according to the size they require. 65% of events require less than 100,000 square feet. There are a rapidly shrinking number of larger events, yet the long term plan, according to the PFD, is a desire to grow to 300,000 square feet (page 2 of the PFD’s Vision2020 document). The City’s lack of recognition as a destination (beyond the Inland Northwest), current hotel inventory, configuration of meeting facilities and indirect airline service all serve to limit its attractiveness to national association group business. Which seems to be saying that Spokane has insufficient hotel rooms, insufficient parking, insufficient airline service, insufficient convention meeting rooms and national level attractions to attract many national (and presumably very large) conventions. Over the past ten years hotel development has become just as important, and possibly more important, than convention center development. Most cities have ample exhibition space today, which causes event planners to compare city locations based on their hotel capacity, quality, price points and proximity to the convention center. At Spokane’s airport the number of year round non-stop destination cities has fallen from 17 to 10 and total passenger counts have for years fallen below the number of passengers in 1996. Half of all flights are flown on turbo props. This is not the level of service the PFD consultant suggests is needed to attract larger conventions. Locally, we blame the national economy. 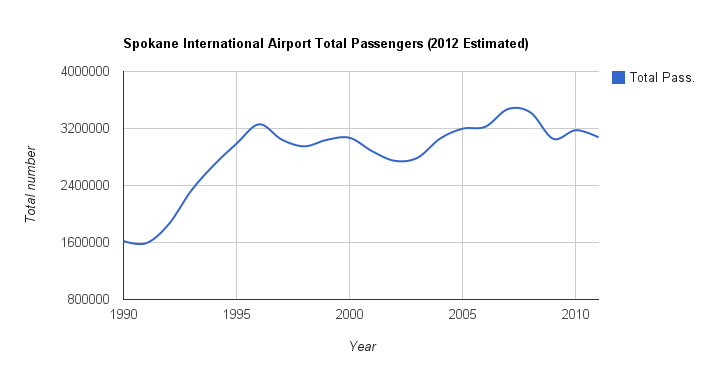 But as this web site has shown, other airports in the Northwest are growing through this period of decline in Spokane. What is the Occupancy of the Convention Center? This chart, from the CH Johnson study, shows exhibit hall occupancy in 2007 (which is the peak attendance year for 2007-2010) at 16.3%. Could we see updated occupancy rates for 2008, 2009, 2010 and 2011? How Often does the Arena Fill All Seats? That information is not available. Measure 1 proposes to expand the Arena by 750 seats so that it would be eligible to hold a 1st or 2nd round NCAA tournament game that might be held in Spokane periodically. The NCAA has increased the minimum required arena size to 12,000 through 2013 and could increase the minimum size again. How many other events fill the present Arena to 100% capacity? How many additional events would come here due to a small increase in available seats? Measure 1 will extend these taxes for another ten years to 2043. 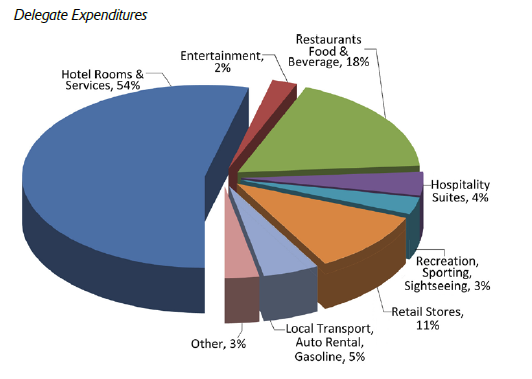 The important components are the 0.1% sales tax (incorrectly shown as 0.01% on the Citizens group’s Facebook page), the 2% tax on hotel and motel customers and an Admissions tax on events at the Spokane PFD facilities. All visitors to Spokane pay the hotel tax even those that do not attend Spokane PFD events. What is the percent of visitors that use PFD facilities and those that do not? The published economic studies exist only for 2007 and February 2009 to January 2010 when both included the US Figure Skating Championships – which the EWU study found accounted for one-third of local economic impacts. This highlights a possible “best case” economic impact but not necessarily what should be expected every year. The EWU study says it is unknown how this selected period compares to an ordinary year (page 38). The full EWU study found that attendees to the skating events spent up to 7 times more money than attendees spent for many other events. The PFD does not provide the full text of the EWU study on their website. Data on other years is missing. The PFD’s own documents do not appear to have data on customers – that is, no data on local or national attendance trends. The omission of a ten year trend chart to provide marketing support for the expansion is surprising. There is no data on Arena attendance and occupancy either. The PFD consultant’s report says Spokane is lacking in hotel space, parking space, airline service and local attractions to draw many national conventions. Measure 1 addresses center size and adds more meeting rooms closer to the exhibit hall. Could more data be made available? The CC and Arena expansions may make sense but the data to support their expansion is missing. There could be other non-monetary reasons to expand PFD facilities such as community pride or a desire to have newer facilities in the area, whether or not they make financial sense. The availability of PFD facilities might attract new people or businesses to the area – but this is not known. A recommendation is made for the PFD to publish straight forward charts(!) showing long term attendance over time both locally and nationally, and provide real market data on easily countable values such as attendance, and estimated economic impact reports for the “off” years. The PFD should also provide information on the number of events that fill the arena to capacity as well as occupancy rates for all facilities. What is the actual occupancy of the Convention Center in terms of percent of square feet being used, for each year? A count of events does not tell us much since many events are small, using a meeting room or a banquet room. The 16% occupancy rate in the PFD’s report raises questions. Could we have explanations for this? The PFD needs to fix the problem of missing data and the appearance of cherry picked study periods. A “likely scenario” economic impact (versus peak points) may justify the expansion but we will never know because the PFD either does not have the data or is not sharing it with the public. The trade show industry’s own report seems to agree that the market for large events is not growing while the market for small events is growing. Are local plans in synch with this? The PFD is a taxpayer funded public agency and the appearance of “sexing up the data”, as it appears, is inappropriate. Good leadership should be asking the questions we’ve posted here. Can we free the missing data? Expansion might make sense – or it might not. With the data mess, we have no idea what is the best decision. There may be more to this story than meets the eye …. The Spokane Tribe proposes to build a $400 million hotel, casino, entertainment, retail mall and convention facility near Airway Heights. Opponents of the casino have formed an “Astroturf” group called “Citizens Against Casinos“. 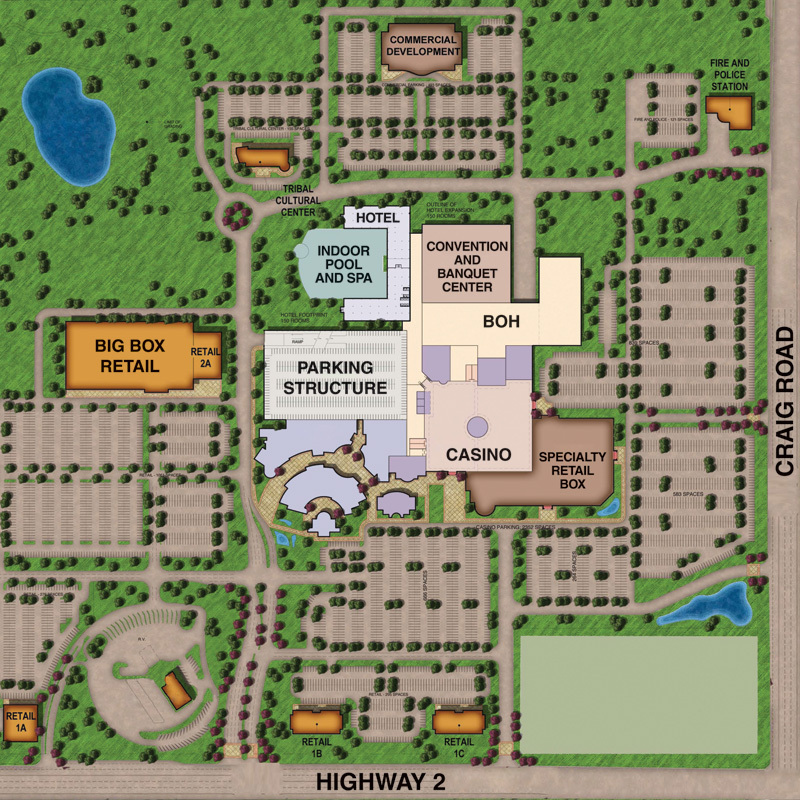 The casino would be a direct competitor of Northern Quest Casino, the Convention Center, other area hotels, restaurants and retail stores. That request should also apply to the Spokane PFD’s missing data. The more actual data all of us have, the better the quality of the decisions we make! Here is a Google Maps aerial view with the location of the proposed casino, the State prison and the Northern Quest Casino added with red labels. 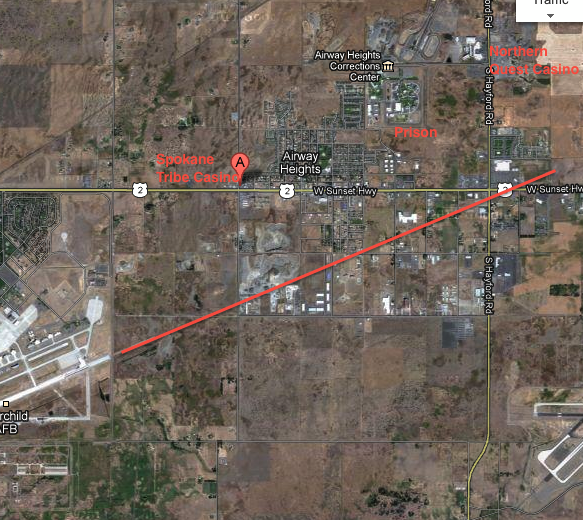 A red line illustrates a straight in approach or departure course for flights in and out of Fairchild AFB. The red line is not necessarily indicative of day to day operations – actual flights may turn after take off or during approach. Pattern flights may occur directly over any of the facilities shown. The proposed casino, the prison and the existing NQC casino are about the same distance from the “red line”; pattern flights and other flight operations may cross over any of them (although they do try to avoid certain areas, like the prison). Another map provided by GSI shows flight operations for a one week period in October over the proposed casino, the prison, and the NQC casino. Something that sticks out in the GSI map is that Fairchild is already 50% “encroached” and is unable to do flight operations on the south side of the airfield due to SIA. This gets worse as SIA has plans to add runways further to the west of the existing airport (and already owns the land). See slide 3-13 of this. Why was this period selected for this chart? Is this representative of year round operations or was this picked like the PFD picked for economic impact studies? What type of aircraft made up these flight operations? The Federal Aviation Administration has given their approval for the casino’s proposed buildings and a preliminary environmental impact study found the Spokane Tribe project would have little impact on the air base. We do not know what the criteria are for choosing bases to close. It is possible that the Federal government will close Fairchild AFB regardless of whether or not the Spokane Tribe’s casino facility is built. Fairchild is already “encroached” on the entire south side of the field and SIA has plans to extend runways into the vacant land between SIA and Fairchild AFB (land is already owned by SIA). By opposing the Tribe’s casino, we may end up without the casino and a closed air base – the worst possible outcome. A big casino that the Spokane Tribe of Indians is proposing has cleared a major regulatory hurdle, but the project is drawing bitter opposition from a rival tribe and from some area business and political leaders. …Airway Heights Mayor Patrick Rushing says GSI just doesn’t want commercial development taking place outside their boundaries. “There is no encroachment, it doesn’t exist, as much as they want it to,” Rushing says. “Airplanes fly over buildings all the time. All parties should provide more data and more information. Better data might support – or contradict – local promoters for both developments but we will not know unless these groups are forthcoming with the information we need to make high quality decisions. We can do evidence-based decision making but only if we have actual data. Can we see some data and some charts please? This blog takes no position on the convention center and arena expansion or the Spokane Tribe’s casino project. There are arguments in favor of and opposed to each project. Data and charts that would help voters make informed decisions are missing and that is the point of this post. Free the data! I have provided links to all the studies and data sources used in this blog post. This is just a blog, okay? Updates to this web site are made on an infrequent basis. May be there will be more updates or may be there will not be more updates. The likelihood of more updates is getting smaller and smaller. A lot of this post was put together last year but edited with new material.